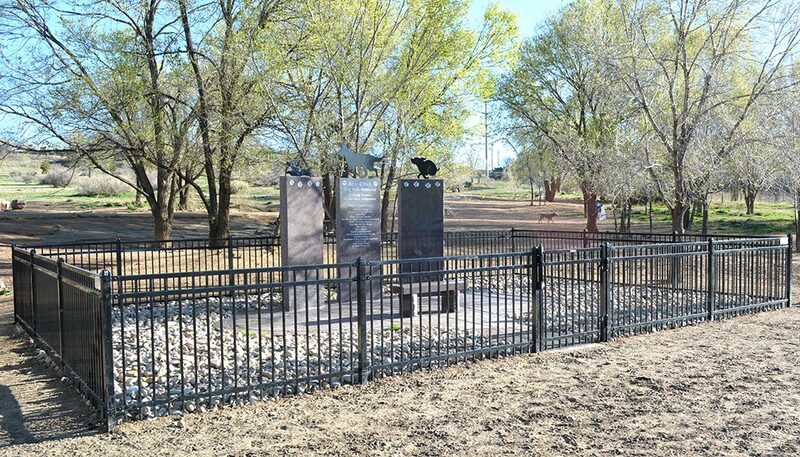 Bear Creek Dog Park is El Paso County’s most visited park, seeing more than 100,000 visitors a year. The 25-acre off-leash dog park is located in Bear Creek Regional Park. The dog park was established in 1997 and is open year-round to canine visitors and their people. The park is comprised of open prairie, hills, woods and a 1/3-mile-long stretch of Bear Creek. There are several walking trails running the length and circumference of the area, including the 3/4-mile primary loop, and several secondary trails. The park includes areas for dogs and people to wade and play in the creek, large areas through which to run and chase balls, and an Agility Training Area that was installed in 2014. A two-acre small dog/senior dog area is separated from the general dog area to provide space for those who wish to keep the dog play to a minimum. Water is provided for thirsty canines as well as a dog washing area for those who get too enthusiastic chasing sticks through the muddy parts of the creek bed. There is a public restroom and fresh water on the grounds for owners. Restrooms are located just inside the gate and are open year round. Handlers are responsible and liable for the actions and behavior of their dogs at all times. For your safety, runners, bicyclists and equestrians shall not use the dog park. Dogs must be on leash in the parking lot and until inside the designated off-leash areas, and dog owners must be in possession of a leash at all times when inside the park. Do not bring dogs younger than 4 months. Dogs must be wearing proof of current inoculation and license. All dogs are required to be spayed/neutered. Female dogs in heat are prohibited. City Ordinance 01-42. If your dog becomes unruly, please leash your dog and leave the dog park. Young children must be supervised at all times. Parents must be in control of their children. No pet handlers under age 18. If you see unruly dogs or owners, please contact El Paso County Security (719) 520-6500 or call 911. In case of a dog-related emergency, please contact the Humane Society of the Pikes Peak Region at (719) 473-1741. 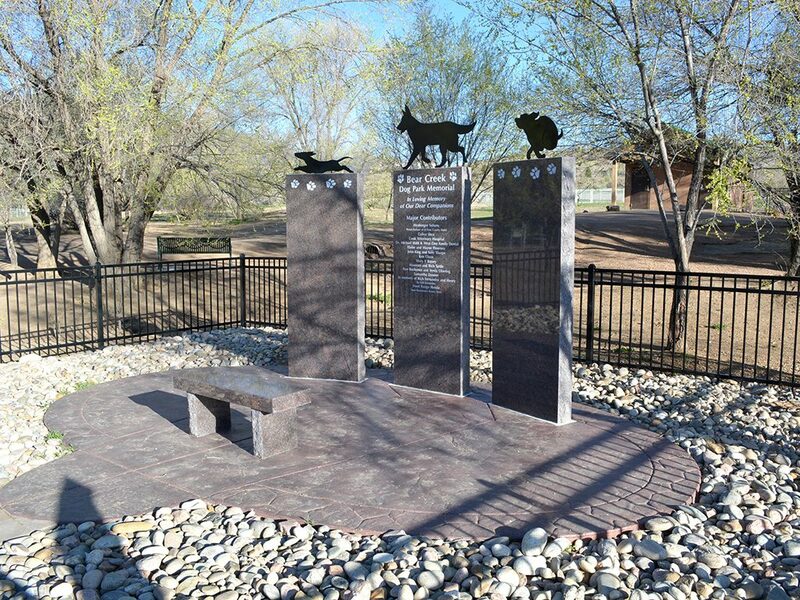 The Bear Creek Dog Park Memorial provides dog owners the opportunity to memorialize their best friend at one of his or her favorite places, Bear Creek Dog Park. The memorial consists of a granite monument with steel dog silhouettes on top and is located along the main entrance trail. 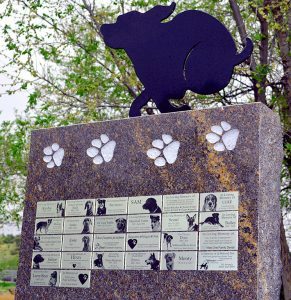 Dog owners have the opportunity to purchase a personalized, inscribed plaque to be placed on the monument in memoriam of their deceased canine companions. Plaques will be available in the near future and will only require a minimum donation of $75. Each dollar donated will help make improvements to your buddy’s favorite place on Earth, and we can’t think of a better tribute to your pup than that. Please download and complete the Memorial Plaque Order Form (PDF) and make your check payable to: Trust for County Parks and write Dog Park Memorial Plaque in the memo line. You can make a donation to the Bear Creek Dog Park through our Trust for County Parks via Paypal.